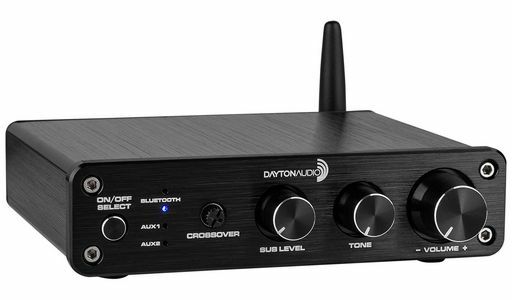 The Dayton Audio DTA-2.1BT2 is a discrete whole system amplifier that provides output for 2 speakers and a passive subwoofer. This design allows you to create a compact 2.1 setup for virtually any room whether it be an office, bedroom, or even a small home theater. The 2 x 50W output power is more than enough for most bookshelf speakers, and the subwoofer output of 100W is ideal for a small subwoofer. The reason the DTA-2.1BT2 is able to produce this exceptional power in such a small package is the Class D topology that is being utilized. This amplifier technology also provides high-efficiency for a low power draw on your electrical system. The DTA-2.1BT2 features the three most popular audio inputs: 3.5 mm, stereo RCA, and of course Bluetooth. The 3.5 mm and RCA inputs are found on the rear of the unit labeled Aux 1 and Aux 2, respectively. The Bluetooth connectivity is extremely convenient for wireless audio playback and is a key feature for any audio enthusiast. The front plate of the DTA-2.1BT2 features 3 knobs providing a gentile tactile feel. The first knob on the left provides control over the subwoofer output. The second knob is a tone control that allows you to attenuate the sonic signature of your speakers. The final and largest knob is the volume control located on the right of the faceplate. The front plate also features an adjustable crossover frequency to fine tune your system (50-120 Hz). There is a discrete push button power switch/source selector located on the front of the unit on the left-hand side. The DTA-2.1BT2 aesthetics offer you an attractive black aluminum case that can easily be the focal point of your 2.1 system. Includes power supply 24Vdc 4A. This inclusive amplifier provides clean Class D power from a compact and modern design. With 100W total power it is designed for stalite systems it can power most main speakers plus a passive subwoofer. An improved design over V1, it gives the user the ability to adjust the sub crossover frequency. This allows you to create an inexpensive and high-performance 2.1 set up for any office, bedroom, or small home theater.